You are here: Home / Oregon Nursery Country / Highland Meadow Nursery Inc. 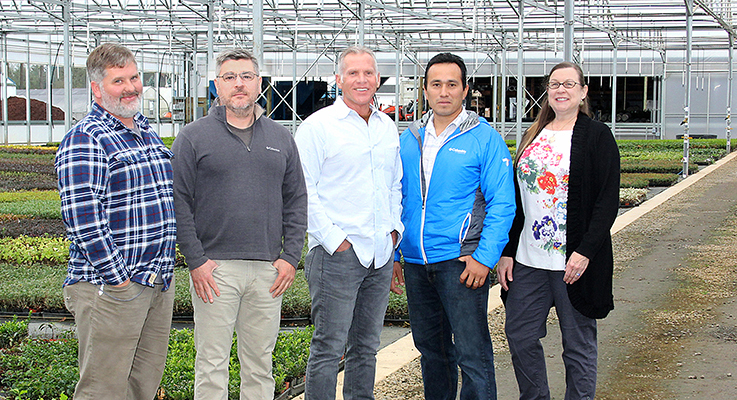 Collaboration with a diverse set of customers has been key to the success of this grower in Molalla, Oregon. Other key people: Operations Manager Gary Grant; Production Manager Trent Staley; Production Supervisor Austreberto “Bert” Delgado; Office Manager Becky Schatz. Averages 30–35 employees during the year. When Dan Staley founded Highland Meadow Nursery in 1995, his plan was to create a nursery on 40 acres that he would be comfortable operating on his own. Some 21 years later, Dan has a 65-acre nursery that employs about 35. “It wasn’t part of the business plan to become this size, or be as intense as this has become,” he said. Dan grows a wide variety of plant material, from trees to shrubs to perennials. It’s all material that he grows on demand. Whatever customers need, he will grow it if the arrangement makes mutual sense. It has ranged from an annual order of three truckloads of one variety and one size all shipped the same day, to an order that will be drawn from and shipped throughout the year (full loads) of 10–15 assorted quantities and sizes. It’s a collaborative relationship. Dan frequently shares production plans with the customers he sells to. Highland Meadow is highly diversified. The nursery grows material in containers, pot-in-pot, conventional greenhouses, gutter-connect greenhouses, retractable shade houses and liner houses. The nursery’s customers include re-wholesalers, retailers and other growers. The material includes trees, shrubs and even perennials. But even in spite of the variety of customers, plant types and production methods, Highland Meadow somehow manages to self-propagate about 80–85 percent of the material that it sells. “It may appear to be a little helter-skelter, but there is a method to the madness, so to speak,” Dan said. Customers are predominantly located in the intermountain area (Utah, Idaho, Nevada) and the Upper Midwest, mostly Minnesota. The rest (about 20 percent) are scattered throughout the country. Although many nursery owners have a family background in horticulture or farming, Dan grew up in the city. He was one of 11 brothers and sisters living in a suburb of Salt Lake City. It was a tough neighborhood, and his family wasn’t well to do. “We all got along, but we just muddled through life,” he said. His initial jobs working on a garbage route and in construction taught him what he wanted out of life — as well as what he didn’t. Above all, he wanted to live a life that portrayed personal responsibility to others and family. He was recruited to join a one-year ornamental horticulture program at Utah State University. “They asked me to come out and join the program, so I did,” Dan said. The program, then in just its second year, involved two semesters of classes and labs and a one-semester internship. The curriculum included all aspects of running a nursery, from budgeting to greenhouse construction to small engine repair. Upon completing the program, Dan was enthusiastic about horticulture and went looking for his first nursery job. “I was fortunate that in 1973 I went to work with a nursery company in the Salt Lake City area,” he said. Porter-Walton Company was a large, family-owned supplier of hard goods and green goods, serving the intermountain area east of the Cascades and west of the Rockies. In 1976, the company went national. In 1980, they expanded by purchasing a nursery in Oregon. They asked Dan to head up the operation. The first half of the 1980s were tough times in the industry and in 1985, the company sold off the green side of the business to a competitor based in Salt Lake City. Dan moved back to the corporate office in Utah for a time, then back to Oregon to be responsible for the Oregon operations. In 1989, Jim Fisher bought the 60-acre site Dan had helped set up for his employer. Dan became an employee of Fisher Farms and helped Jim fold the two sites together. Throughout all of these work experiences in Utah and in Oregon, Dan learned a great deal from a series of employers and mentors. He melded together bits and pieces of knowledge that he acquired to become the nursery professional he is today. While still with Fisher, Dan set the wheels in motion to start Highland Meadow. He conceived the idea in 1994. “I was still working at the Sherwood location of Fisher Farms while doing this,” he said. But by 2000, Dan felt that both operations needed his full attention. He resigned at Fisher Farms and made Highland Meadow his full-time job. The nursery continued to grow through the boom years of the early 2000s. In 2004, Dan purchased an adjacent 25 acres for future expansion. By 2007, he was ready to use them. Although this was right before the Great Recession began, the timing worked out because it situated Highland Meadow for the ensuing recovery. Dan’s principles of nursery production are to synchronize, simplify and streamline. It’s an industry Dan loves to work in. As a nursery owner, Dan’s hope is to provide employees with the same sort of opportunity and mentorship that benefitted him when he was younger. After all, that’s what Dan did. And every day, he comes to work feeling grateful for the opportunities he received.